There is only one baked good that has the ability to make me pace around the kitchen, peeking into the oven every two minutes, like a five year old waiting for cookies to cool. Bread. Pan . Pain. Brot. Pane. Whatever you may call it, baking bread is truly joyful baking. Since those sunny weekends of my childhood when my grandmother and mother would bake for the following work week, I have had an addiction to making and, of course, consuming bread. Undoubtedly, baking takes me back to those carefree days and in a strange way, I feel connected to my family at that moment. Evidence, maybe, that the family that cooks or bakes together stays together, even though they may be separated by hundred of miles? There is also a great sense of accomplishment creating the perfect loaf of bread. For me, this took a lot of practice. I initially started as a "combiner" combining flour, yeast, sugar, etc., in the way my mother taught me, without an appreciation for the specific role of the ingredients or the method. Kneading the dough is the most important part of the entire bread making process. This I learned the hard way. Literally. I remember once combining the ingredients for dinner rolls and kneading it for just a few seconds, just long enough for it all to come together but not long enough for the gluten to develop. I must have also erred on the liquid measurements. Instead of dinner rolls, I essentially made edible tennis balls that night. Thankfully those days are long gone, and I am proud to post this cheese bread recipe. (Bread and cheese. Who can go wrong?) The best part: no waiting for anything to cool! 1. In a large mixing bowl, mix yeast, sugar and only 1/2 cup of the whole wheat flour. Add the warm water, mix until combined and set aside for ferment until foamy, about ten to 15 minutes. 2. Meanwhile, combine the remaining 1 cup of whole wheat flour, all purpose flour and salt. 3. Once the yeast mixture is foamy, add the dry flour mixture. Using a large spoon or your fingers ( I prefer the latter), combine flour and yeast mixtures until combined. 4. Remove to a floured work surface. Flatten slightly and add grated cheese on top of dough. Carefully knead cheese into dough, about 5 minutes, until a smooth elastic ball forms and all the cheese had been properly incorporated. Place dough in a well greased bowl, cover with a tea cloth and set in a dry warm place to rise, about an hour, until doubled in size. 5. After an hour, punch the dough to remove air. Divide into two pieces. Form each into a smooth ball and flatten slightly, until 3 inches thick. Place on greased baking sheet, cover with tea cloth and leave to rise again until doubled in size, an additional hour. Make slanted score marks on each loaf using a sharp serrated knife. 6. Preheat oven to 350 degrees F. Bake bread for 25 to 30 minutes until beautifully golden brown on the outside. 7. Remove from oven, but please, do not wait to eat!!! Warm bread is one of life's simple pleasures. Just made this tonight. Sprinkle some cheese, coarse salt, and red pepper on top of the dough mounds before baking for a more savory bread. Delicious! I know what you mean by being tempted by bread. 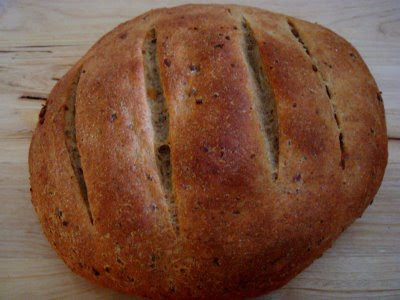 There is nothing like warm homemade bread to share with family and friends. I like your combination of toppings; very earthy. I'm sure it was delicious.